Ray Rankin, Eastern Allamakee Agriculture/Industrial Technology teacher, is interning for six weeks at Gruber Ridge Ag located outside of Lansing, Iowa which is a 2,500 head sow farm managed by Waukon Feed Ranch. 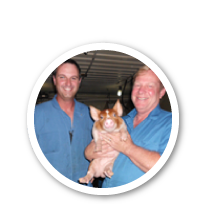 When asked why he wanted to work at a pig farm Mr. Rankin said, "I have zero experience with swine, and since Iowa is the nation's leader in swine production I wanted to learn some things about it that I could take back to my classroom to share with my students. What better way than hands on!" How do you keep track of all of the pigs? First few days in as sow farm.... Whew! !